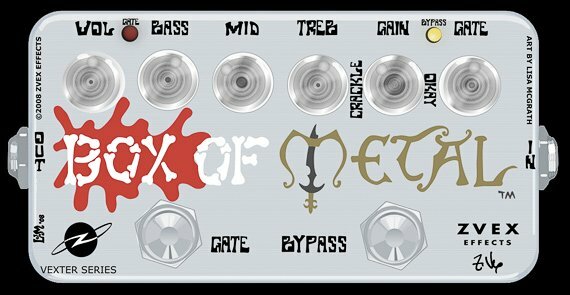 The Box of Metal (tm) is an aggressive high-gain pedal with a highly-effective built-in switchable gate which dramatically reduces noise and unwanted feedback. Its gain and tonal characteristics are somewhat similar to high-gain tube amplifiers that have been the staple of hard rock and metal sounds since the 80's. On the right, there is a truebypass switch with an indicator LED to bypass the entire effect. On the left is a gate switch which is only effective when the pedal is on (the gate cannot be used separately.) When the gate's LED (on the left side of the pedal) is ON, the gate will be active whenever the pedal is turned on. The gate is very useful for cleaning up any noise between palm-muted chords and lead phrases, but may be switched off to initiate feedback or to stretch out soloed notes that are fading into noise. Switching off and on the gate is silent so the gating action of the pedal can instantly be changed during any part of the performance to fluidly integrate soloing and palm-muted chords.